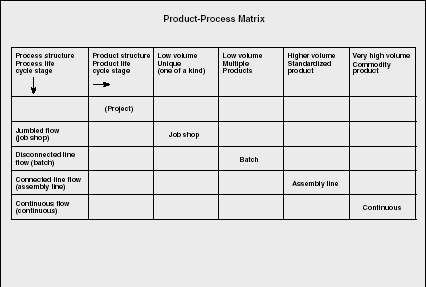 The product-process matrix is a tool for analyzing the relationship between the product life cycle and the technological life cycle. It was introduced by Robert H. Hayes and Steven C. Wheelwright in two classic management articles published in Harvard Business Review in 1979, entitled "Link Manufacturing Process and Product Life Cycles" and "The Dynamics of Process-Product Life Cycles." The authors used this matrix to examine market-manufacturing congruence issues and to facilitate the understanding of the strategic options available to a company. The matrix itself consists of two dimensions, product structure/product life cycle and process structure/process life cycle. The production process used to manufacture a product moves through a series of stages, much like the stages of products and markets, which begins with a highly flexible, high-cost process and progresses toward increasing standardization, mechanization, and automation, culminating in an inflexible but cost-effective process. The process structure/process life cycle dimension describes the process choice (job shop, batch, assembly line, and continuous flow) and process structure (jumbled flow, disconnected line flow, connected line flow and continuous flow) while the product structure/product life cycle describes the four stages of the product life cycle (low volume to high volume) and product structure (low to high standardization). Later writers on the subject sometimes insert an additional stage in the extreme upper-left corner of the matrix: the project. A company can be characterized as occupying a particular region on the matrix (see accompanying Figure). This region is determined by the firm's stage in the product life cycle and the firm's choice of production process. At the upper left extreme, firms are characterized as process oriented or focused while the lower right extreme holds firms that are said to be product focused. The decision of where a firm locates on the matrix is determined by whether the production system is organized by grouping resources around the process or the product. Note from the figure that the vertices of the matrix result in four distinct types of operations (described by the appropriate process choice) located on the diagonal of the matrix. Projects are briefly included in the discussion since they are sometimes found at the extreme upper-left corner of the matrix (depending on the author). These include large-scale, one-time, unique products such as civil-engineering contracts, aerospace programs, construction, etc. They are also customer-specific and often too large to be moved, which practically dictates that project is the process of choice. broken cog to a machine shop where they would manufacture a new one from scratch. This machine shop (along with tool and die manufacturers) is probably the primary example of manufacturing job shops. A job shop is the producer of unique products; usually this product is of an individual nature and requires that the job shop interpret the customer's design and specifications, which requires a relatively high level of skill and experience. Once the design is specified, one or a small number of skilled employees are assigned to the task and are frequently responsible for deciding how best to carry it out. Generally, resources for processing have limited availability with temporary in-process storage capability needed while jobs wait for subsequent processing. If the product is not a one-time requirement, it is at least characterized by irregular demand with long periods of time between orders. Efficiency is difficult since every output must be treated differently. In a job shop, the outputs differ significantly in form, structure, materials and/or processing required. Each unique job travels from one functional area to another according to its own unique routing, requiring different operations, using different inputs, and requiring varying amounts of time. This causes the flow of the product through the shop to be jumbled, following no repetitive pattern. Job shops and batch operations (upper-left quadrant of the matrix) are usually organized around the function of the individual machines. In other words, machinery is grouped according to the purpose it serves or the capabilities it possesses. For example, in a machine shop, hydraulic presses would be grouped in one area of the shop, lathes would be grouped into another area of the shop, screw machines in another area, heat or chemical treatment in still another, and so on (also contributing to the jumbled flow). This is labeled a process layout. In addition to machine shops and tool and die manufacturers, job shops are also appropriate for use in service operations, since the product is customized and frequently requires different operations. Service examples include law offices, medical practices, automobile repair, tailor shops, and so forth. Firms utilizing batch processes provide similar items on a repeat basis, usually in larger volumes than that associated with job shops. Products are sometimes accumulated until a lot can be processed together. When the most effective manufacturing route has been determined, the higher volume and repetition of requirements can make more efficient use of capacity and result in significantly lower costs. Since the volume is higher than that of the job shop, many processes can be utilized in repetition, creating a much smoother flow of work-in-process throughout the shop. While the flow is smoother, the work-in-process still moves around to the various machine groupings throughout the shop in a somewhat jumbled fashion. This is described as a disconnected line flow or intermittent flow. Examples of batch processing operations include printing and machine shops that have contracts for higher volumes of a product. Services utilizing batches could be some offices (processing orders in batches), some operations within hospitals, classes within universities (how many classes have only one pupil? ), and food preparation. When product demand is high enough, the appropriate process is the assembly line. Often, this process (along with continuous; both are in the lower-right quadrant of the matrix) is referred to as mass production. Laborers generally perform the same operations for each production run in a standard and hopefully uninterrupted flow. The assembly line treats all outputs as basically the same. Firms characterized by this process are generally heavily automated, utilizing special-purpose equipment. Frequently, some form of conveyor system connects the various pieces of equipment used. There is usually a fixed set of inputs and outputs, constant throughput time, and a relatively continuous flow of work. Because the product is standardized, the process can be also, following the same path from one operation to the next. Routing, scheduling, and control are facilitated since each individual unit of output does not have to be monitored and controlled. This also means that the manager's span of control can increase and less skilled workers can be utilized. The product created by the assembly-line process is discrete; that is, it can be visually counted (as opposed to continuous processes which produce a product that is not naturally divisible). Almost everyone can think of an example of assembly-line manufacturing (automobile manufacturing is probably the most obvious). Examples of assembly lines in services are car washes, class registration in universities, and many fast food operations. Because the work-in-process equipment is organized and sequenced according to the steps involved to produce the product and is frequently connected by some sort of conveyor system, it is characterized as flowing in a line. Even though it may not be a straight line (some firms utilize a U-shaped assembly line) we say that it has a connected line flow. Also, firms in the lower-right quadrant (line and continuous) are classified as having a product layout. Continuous manufacturing involves lot-less production wherein the product flows continuously rather than being divided. A basic material is passed through successive operations (i.e., refining or processing) and eventually emerges as one or more products. This process is used to produce highly standardized outputs in extremely large volumes. The product range is usually so narrow and highly standardized that it can be characterized as a commodity. Considerable capital investment is required, so demand for continuous process products must be extremely high. Starting and stopping the process can be prohibitively expensive. As a result, the processes usually run 24 hours a day with minimum downtime (hence, continuous flow). This also allows the firm to spread their enormous fixed cost over as large a base as possible. The routing of the process is typically fixed. As the material is processed it usually is transferred automatically from one part of the process to the next, frequently with self-monitoring and adjusting. Labor requirements are low and usually involve only monitoring and maintaining the machinery. Typical examples of industries utilizing the continuous process include gas, chemicals, electricity, ores, rubber, petroleum, cement, paper, and wood. Food manufacture is also a heavy user of continuous processing; especially water, milk, wheat, flour, sugar and spirits. The product-process matrix can facilitate the understanding of the strategic options available to a company, particularly with regard to its manufacturing function. A firm may be characterized as occupying a particular region in the matrix, determined by the stages of the product life cycle and its choice of production process(es) for each individual product. By incorporating this dimension into its strategic planning process, the firm encourages more creative thinking about organizational competence and competitive advantage. Also, use of the matrix provides a natural way to involve manufacturing managers in the planning process so they can relate their opportunities and decisions more effectively with those of marketing and of the corporation itself, all the while leading to more informed predictions about changes in industry and the firm's appropriate strategic responses. Each process choice on the matrix has a unique set of characteristics. Those in the upper-left quadrant of the matrix (job shop and batch) share a number of characteristics, as do those in the lower-right quadrant (assembly line and continuous). Upper-left firms employ highly skilled craftsmen (machinists, printers, tool and die makers, musical instrument craftsmen) and professionals (lawyers, doctors, CPAs, consultants). Hence upper-left firms can be characterized as labor intensive. Since upper-left firms tend to utilize general-purpose equipment, are seldom at 100 percent capacity, and employ workers with a wide range of skills, they can be very flexible. However, there is a difficult trade-off between efficiency and flexibility of operations. Most job shops tend to emphasize flexibility over efficiency. Since efficiency is not a strong point of upper-left firms, neither is low-cost production. Also, the low volume of production does not allow upper-left firms to spread their fixed costs over a wide enough base to provide for reduced costs. Finally, upper-left firms are also more likely to serve local markets. Lower-right firms require production facilities that are highly specialized, capital intensive, and interrelated (therefore, inflexible). Labor requirements are generally unskilled or semi-skilled at most. Much of the labor requirement deals with merely monitoring and maintaining equipment. Lower-right firms are also more likely to serve national markets and can be vertically integrated. Hayes and Wheelwright relate three areas affected by the use of the product-process matrix: distinctive competence, management, and organization. Distinctive competence is defined as the resources, skills, and organizational characteristics that give a firm a comparative advantage over its competitors. Simply put, a distinctive competence is the characteristic of a given product that causes the buyer to purchase it rather than the similar product of a competitor. It is generally accepted that the distinctive competencies are cost/price, quality, flexibility and service/time. By using the product-process matrix as a framework, a firm can be more precise about its distinctive competence and can concentrate its attention on a restricted set of process decisions and alternatives and a restricted set of marketing alternatives. In our discussion, we have seen that the broad range of worker skills and the employment of general-purpose equipment give upper-left firms a large degree of flexibility while the highly specialized, high-volume environment of lower-right firms yields very little in the way of flexibility. Therefore, flexibility would be a highly appropriate distinctive competence for an upper-left firm. This is especially true when dealing with the need for flexibility of the product/service produced. Lower-right firms find it very difficult to sidetrack a high-volume operation because of an engineering change in the product. An entire line would have to be shut down while tooling or machinery is altered and large volumes of possibly obsolete work-in-process are accounted for. Upper-left firms, however, would have none of these problems with which to contend. It must be noted though that lower-right firms may possess an advantage regarding flexibility of volume. Quality may be defined a number ways. If we define quality as reliability, then lower-right firms could claim this as a distinctive competence. Lower-right firms would have the high volume necessary to quickly find and eliminate bugs in their product, yielding more reliability to the end user. However, if we define quality as quality of design (that is, "bells and whistles"—things that embody status, such as leather seats in an automobile or a handcrafted musical instrument), then quality would be seen as a possible distinctive competence of upper-right firms. Service may also be defined in more ways than one. If one defines service as face-to-face interaction and personal attention, then upper-left firms could claim service as a distinctive competence. If service is defined as the ability to provide the product in a very short period of time (e.g., overnight), then service as a distinctive competence would belong to lower-right firms. Finally, remember that high volume, economies of scale, and low cost are characteristics of firms in the lower-right quadrant of the matrix. Upper-left firms produce low volumes (sometimes only one) and cannot take advantage of economies of scale. (Imagine, for instance, what you would have to pay for a handcrafted musical instrument.) Therefore, it is obvious that price or cost competitiveness is within the domain of lower-right firms. In general, the economics of production processes favor positions along the diagonal of the product-process matrix. That is, firms operating on or close to the diagonal are expected to outperform firms choosing extreme off-diagonal positions. Hayes and Wheelwright provide the example of a firm positioned in the upper-right corner of the matrix. This would appear to be a commodity produced by a job shop, an option that is economically unfeasible. A firm positioned in the lower-left corner would represent a unique one-time product produced by a continuous process, again not a feasible option. Both examples are too far off the diagonal. Firms that find themselves too far off the diagonal invite trouble by impairing their ability to compete effectively. While firms operating in the near vicinity, but not exactly on the diagonal, can be niche players, positions farther away from the diagonal are difficult to justify. Rolls Royce makes automobiles in a job shop environment but they understand the implications involved. Companies off the diagonal must be aware of traps it can fall into and implications presented by their position. Also, a firm's choice of product-process position places them to the right or left of competitors along the horizontal dimension of the matrix and above or below its competitors along the vertical dimension of the matrix. The strategic implications are obvious. Of course, a firm's position on the matrix may change over time, so the firm must be aware of the implications and maintain the capability to deal with them appropriately. The matrix can provide powerful insights into the consequences of any planned product or process change. Use of the product-process matrix can also help a firm define its product. Hayes and Wheelwright relate the example of a specialized manufacturer of printed circuit boards who produced a low-volume, customized product using a highly connected assembly-line process. Obviously, this would place them in the lower-left corner of the matrix; not a desirable place to be. This knowledge forced the company to realize that what they were offering was not really circuit boards after all, but design capability. So, in essence, they were mass-producing designs rather than the boards themselves. Hence, they were not far off the diagonal at all. Firms organize different operating units so that they can specialize on separate portions of the total manufacturing task while still maintaining overall coordination. Most firms will select two or more processes for the products or services they produce. For example, a firm may use a batch process to make components for products, which are constructed on assembly lines. This would be especially true if the work content for component production or the volume needed was not sufficient for the creation of a dedicated line process. Also, firms may need separate facilities for different products or parts, or they may simply separate their production within the same facility. It may even be that a firm can produce the similar products through two different process options. For example, Fender Musical Instruments not only mass produces electric guitars (assembly line) but also offers customized versions of the same product through the Fender Custom Shop (job shop). Again, the matrix provides a valuable framework for diagnostic use in these situations. Analyzing the product entry and exit. Determining the appropriate mix of manufacturing facilities, identifying the key manufacturing objectives for each plant, and monitoring progress on those objectives at the corporate level. Reviewing investment decisions for plants and equipment in terms of their consistency with product and process plans. Determining the direction and timing of major changes in a company's production processes. Evaluating product and market opportunities in light of the company's manufacturing capabilities. Selecting an appropriate process and product structure for entry into a new market. It should be noted that recent empirical research by Sohel Ahmad and Roger G. Schroeder found the proposed relationship between product structure and process structure to be significant but not strong. In general terms, they found that as the product life cycle changes the process life cycle also shifts in the consistent direction, but not necessarily along the diagonal. Some 60 percent of the firms studied did not fall on the diagonal. The researchers propose that this occurred because new management and technological initiatives have eliminated or minimized some of the inherent trade-offs found on the Product-Process Matrix. They classify these initiatives as processing technology, product design and managerial practice (e.g., TQM and JIT). Therefore, Ahmad and Schroeder recommend that the matrix be conceptualized as having three axes instead of two. They propose an x-axis (product life cycle stages), a y-axis (process life cycle stages), and a z-axis that represents an organization's proactive effort towards adopting and implementing these innovative initiatives. As a firm moves away from the origin along the z-axis, it becomes able to minimize some of the trade-offs seen in the Product-Process Matrix framework. Ahmad, Sohel, and Roger G. Schroeder. "Refining the Product-Process Matrix." International Journal of Operations and Production Management 22, no. 1 (2002): 103–124. Anupindi, Ravi, Sunil Chopra, Sudhakar D. Deshmukh, Jan A. Van Mieghem, and Eitan Zemel. Managing Process Business Flows. 2nd ed. Upper Saddle River, NJ: Pearson Prentice Hall, 2006. "The Dynamics of Process-Product Life Cycles." Harvard Business Review, March-April 1979, 27–136. Finch, Byron. Operations Now. 2nd ed. Boston: McGraw-Hill Irwin, 2006. Hayes, Robert, and Steven C. Wheelwright. "Link Manufacturing Process and Product Life Cycles." Harvard Business Review, January-February 1979, 133–140.